The Chattooga River Chapter of Trout Unlimited has donated $10,000 to the S.C. Department of Natural Resources' Native Brook Trout Genetics Study. The effort by the S.C. Department of Natural Resources (DNR) is part of a major brook trout restoration program in South Carolina. The $10,000 donation to DNR from the Chattooga River Chapter of Trout Unlimited was obtained from the Pete and Sally Smith Foundation, administered by Wells Fargo Philanthropic Services. The funds will be used to cover the costs of genetic analysis by a contracted biotechnology lab. 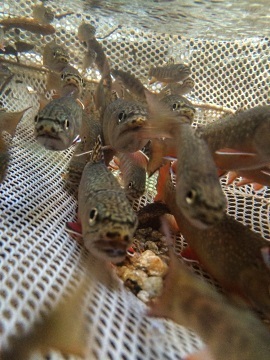 The genetics screening will ensure wild brook trout used in restoration efforts are from pure native sources and maintain sufficient genetic diversity. The funds will also support brook trout restoration in Jocassee Gorges, and Trout Unlimited will recruit at least 25 members to assist in the work done by DNR. Duke Energy is also a major partner in the Eastern brook trout work done by DNR. The Pete and Sally Smith Foundation, based in Charlotte, N.C., supports charitable causes in the areas of education, environment, and medical research/disease management in Rhea County, Tennessee and Oconee County, South Carolina. Trout Unlimited, America's leading coldwater conservation organization, is a community of more than 150,000 anglers dedicated to protecting, reconnecting and restoring North America's trout and salmon fisheries. Trout Unlimited is America's leading coldwater conservation organization. For more information, visit http://www.tu.org.